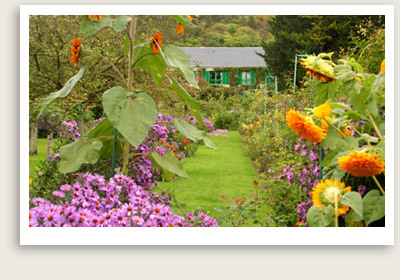 Giverny Tours Include: Our private Giverny tours include entrance to Monet’s house, Norman Garden, Water Garden and the artist’s workshop. Private tour guide, private roundtrip door-to-door transportation, taxes, tolls and parking are also included. Cost of lunch additional. Note: Afternoons Only; closed on Mondays. 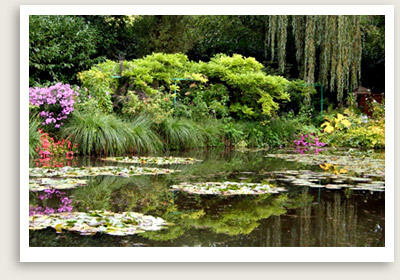 This private Giverny tour gives you a guided introduction to the life and work of impressionist painter Claude Monet. You will tour Monet’s house and workshop, the formal enclosed Norman Garden, and the romantic Water Garden with the Pond and Japanese Bridge. Though optional, one of our favorite highlights of this Giverny tour is lunch stop at a charming restaurant in the countryside by a 200-year-old water mill. You will also enjoy a visit to the Museum of American Art. On your way back to Paris, your private tour guide will take the Route des Crêtes , a charming scenic route from which you can glimpse the Seine Valley; a beautiful 10th century watchtower; and the village and the fabulous château of La Roche Guyon, headquarters of General Rommel during World War II. Your Giverny tour also includes a stop at the village of Vetheuil, where Monet lived for three years.